This post was co-written by John Edwards. If you’re not already familiar with his work, you can (and should!) follow him here. Launch angle and exit velocity became a big deal when MLB released them through Statcast at the start of the 2016 season. They instantly told an old story in a new way. It wasn’t surprising to see Nelson Cruz, Giancarlo Stanton, or Miguel Cabrera at the top of the leaderboards. We knew they knocked the snot out of the ball. But now we knew that they knocked the snot out of the ball in excess of 110 mph or better, and at 34 degrees or better. Two years later and the terms are nearly ubiquitous, even speckled through broadcasts. But they’re often provided without context as colorful notes in single instances. Do we really care how fast the ball went out in the moments we’re watching, or at what angle, as long as it went out? It doesn’t tell us how the dinger or double or snagged liner happened, just that it did; and we just saw it with our own eyes. So, what about that how? What’s contributing to a player generating that record exit velo or optimal launch angle? Swing speed could help inform us of how well a player is tuned into their timing at the plate and where they’re making contact, both of which tell more of our old story in an exciting new way than launch angle or exit velo alone. But the problem with swing speed is we don’t have that data. It’s simply unavailable: while Baseball Savant used to feature bat speed it no longer does. Fortunately, enough data exists that we have approximations to work with. David Marshall reverse-engineered the formula Baseball Savant used in calculating swing speed – and now we can play around with those numbers! Let’s look at who the best hitters were by bat speed last season, with a minimum of 100 batted ball events. 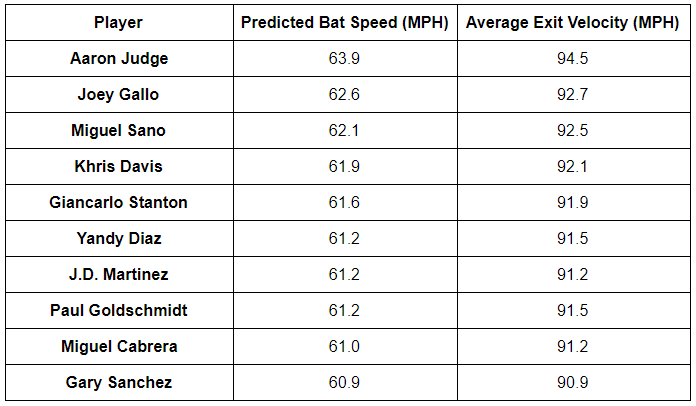 Since the formula for predicted bat speed is essentially average exit velocity (AEV) accounting for pitch speed, and AEV is the majority factor in the equation, the leaders in bat speed are also among the leaders in AEV. But there are still some differences, and they’re some very important differences! The speed at which a pitch comes in affects how fast it goes out, so players facing pitchers who throw harder might register lower average exit velocities than a player with comparable bat speed facing pitchers who throw slower. But bat speed isn’t consistent from plate appearance to plate appearance. Sometimes you check your swing, other times you let loose. 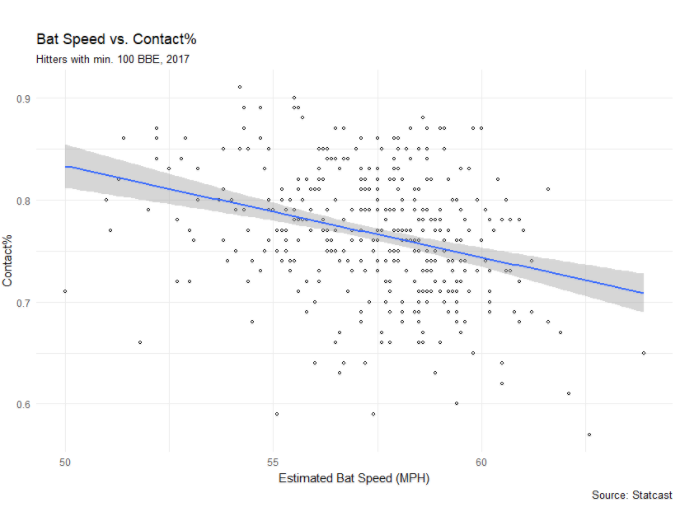 But there’s an important trade-off: many of the hitters with superb bat speed strike out frequently, and hitters with low bat speed (Mallex Smith, 50.0 MPH or Billy Hamilton, 51.0 MPH) make a lot of contact without striking out. Low bat speeds allow for more contact and fewer whiffs, but high bat speeds allow for better contact at the expense of greater whiffs. As a result, bat speed is loosely correlated to contact% (R^2 of 0.09), and better correlated to contact% than exit velocity (R^2 of 0.08). MLB hitters are aware of this loose correlation. Since 2015, they’ve swung .4 MPH slower than average with two strikes, collectively opting for more contact and foul balls so they can stay alive longer in at-bats. But the guys who are the best at managing this are among the best in the game at generating offense, and they don’t all necessarily slow down their swings at the same rate. However, each had a wOBA with two strikes roughly 15% better than overall league average in 2017. The leaders here show us multiple paths to success with two strikes in regard to players slowing down or speeding up their bats. Beyond that, we get a few bands of players worth noting. Anthony Rendon and Francisco Lindor were really in a class of their own last year when it came to generating offense. They’re the only two players who were about 80% better than the average player overall, and lost less than 60 percentage points of wOBA with two strikes. Rendon only swung .2 MPH slower in those instances while Lindor swung .9 MPH slower. That’s not to say they were the best, though. Joey Votto (2.1 MPH slower), Austin Barnes (1.0), Mike Trout (.4), Bryce Harper (.4 faster), and Rhys Hoskins (.5 faster) generated the most offense with two strikes. Collectively, they were so much better than most of their peers that they were able to absorb a bigger drop in effectiveness with two strikes in the count and still pose a considerable threat. Whether swinging slower or faster than average with two strikes, the way these players optimized their swing speed with two strikes informs us of their approach more than their launch angles or exit velos alone. But what about the guys at the other end of the spectrum? Giancarlo Stanton and JD Martinez had the largest differences in offense created with two strikes of anyone in the league. You can see all the data here. Per John’s own Statcast database, they each had dips in wOBA of more than 160 points when their backs were up against the wall, implying that the way they sold out for power when they were down to their final strike really didn’t work in their favor. They both swung slower than the .4 MPH average drop in those instances, and a peak at their heat maps suggests they were way more willing to hack at offerings out of the zone, too. A lot of their peers actually acted in a similar manner, too. It turns out that 40 of the 50 players who saw the biggest drop in wOBA with two strikes slowed down their bat in those counts. They’re even more diverse of a group of players than the ones who saw the least drop. There might not be another offensive context where you’ll see Carlos Correa ranked with Lonnie Chisenhall, or Jose Altuve with Michael A. Taylor, or Josh Donaldson with Patrick Kivlehan. Examining players in this light provides a unique perspective to some of the game’s most critical moments. Despite the variance in the quality between these players, the 2017 approximations suggest that they didn’t exhibit much of a two strike approach at all. Slowing down your bat but expanding your strike zone to chase pitches that are inherently less hittable seems like a recipe for Ks. If swing speed can tell us who’s optimizing their approach at the plate — or who isn’t — can it also help us predict a outbreak? We compiled hitters with at least 100 batted ball events in 2016 and 2017 (using batted ball events since our predicted bat speed equation uses exit velocity), and saw which hitters saw the most improvement from 2016 to 2017. Unsurprisingly, swinging harder resulted in much better production at the plate. Conversely, most hitters who declined in bat speed declined in production (except for Delino DeShields, curiously enough). But having a slow bat speed isn’t necessarily a bad thing, nor should all players strive to increase their bat speed. We discussed previously how bat speed and contact% are inversely related — not swinging out of your shoes every at-bats means that you have better time to react to pitches and make contact. For hitters like DeShields, Suzuki, and Gordon, they want as much contact as possible – their maximum bat-speed isn’t comparable to guys like Gallo and Judge, so there isn’t really a way to sell out for power here. Judge and Gallo can get away with striking out so much because the few balls that they put in play frequently go yard, but if someone like Gordon adopted that approach, the increase in power wouldn’t compensate for the increased strikeout rate. Instead, Deshields, Suzuki, and Gordon produce by making as much contact as possible and relying on their speed to beat out hits on their weak contact. By relying on their speed and balls-in-play for production, it’s beneficial for these hitters to not swing out of their shoes. Using bat speed to predict breakouts is similar to looking at exit velocity changes to predict breakouts, but has its trade-offs: it’s better in that it accounts for differences in pitch velocities faced, but it’s worse in that our bat speed predictions are only approximations. They’re still something, though, and they give us more of a predictive look at what goes into making a great hitter than hearing about their launch angle or exit velo in isolated instances. We hoped you liked reading Swing Speed: Exit Velocity’s More Impressive Cousin by Tim Jackson! How Much Does April Matter? 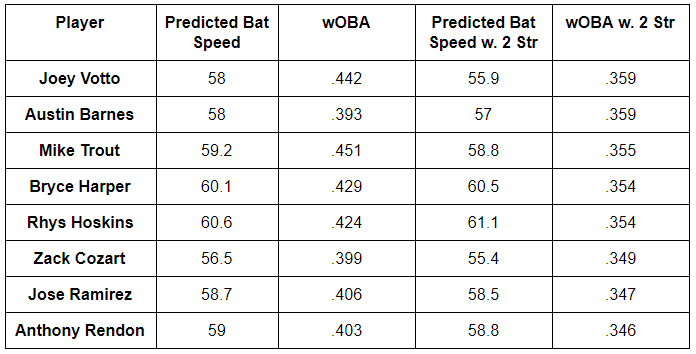 The sweet spot speed is a good point that I suspected too but the bat sensors like blast or zepp that I contacted when I first read the swing speed data from savant (who get similar numbers as you get so your math is probably right) said they already account for that and they still measure top pros at 90+. So we still have at least a 20 mph gap. I believe swing speed is very important for power potential but it provably doesn’t explain why gallo hits one at 90 and the next at 110.